ST. LOUIS - A group of Webster students are collaborating with the St. Louis Symphony to shine a new light on the holiday favorite “The Nutcracker.” During the live performances of the music, special lighting and images designed by Webster University Leigh Gerdine College of Fine Arts students will be projected on a screen to set the mood for the piece. The performances of act two of Tchaikovsky’s classic work take place at Powell Hall at 8 p.m. Dec. 2-3 and 3 p.m. Dec. 4. 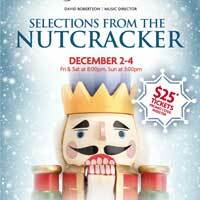 Discount tickets are available for the Dec. 2 and Dec. 3 shows to Webster University employees and students for the show. Faculty and staff can buy tickets for $25 per show by using the promotional code “Webster” when ordering tickets online at stlsymphony.org. Students can purchase tickets in advance for $10 at stlsymphony.org/students or for $20 at the door by showing a valid student identification. Last year, students in Leigh Gerdine collaborated with the St. Louis Symphony to create new visuals for “Peter and the Wolf.” The shows nearly sold out and receive wide praise from the art community. Last year’s story on that project can be read at http://news.webster.edu/academics/2015/peter-and-the-wolf.html. This year’s collaboration is conducted by Ward Stare. Besides act two of “The Nutcracker,” the Symphony also will perform Borodin’s “Prince Igor” overture and selections from Tchaikovsky’s suites from “Sleeping Beauty” and “Swan Lake” featuring St. Louis Symphony concertmaster David Halen. For more information about the St. Louis Symphony, visit stlsymphony.org.